The Falcon 2000EX, the extended-range version of the Falcon 2000, can climb directly to 37,000 feet in sixteen minutes and can fly 3,800 nm at Mach 0.8, carrying six passengers. The Falcon 2000EX features a variety of smart configurations, ranging from the leather, wood and china to the seating arrangements and technical capabilities. After the success of the DA900 series triple engine intercontinental jet line, Dassault Aviation announced the next Falcon iteration set to replace the Falcon 20/200 line. The design for the Falcon 2000 series closely follows that of its predecessor, the Falcon 900 series. The Falcon 2000EX offers an impressive range of 3,800 nautical miles with eight passengers on board. The Falcon 2000 first flew in March of 1993, and the private jet received FAA certification in February of 1995. Production on the Falcon 2000EX started in 2003 and ended in 2009. 130 aircraft have been built so far. 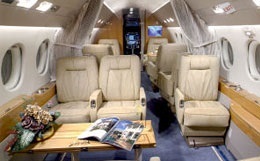 The Falcon 2000EX is capable of accommodating as many as nineteen passengers, but is usually configured to seat eight. With a similar layout to the Falcon 900 series, the cabin of the Falcon 2000EX is wide enough to seat three abreast with an aisle, and is normally split into front and rear areas, with club seating in each area. The roomy cabin of the Falcon 2000EX measures 26.3 feet in length, 6.2 feet in height, and 7.7 feet in max width with a floor width of 6.3 feet. This private business jet features 134 cubic feet of storage capacity capable of accommodating 1,600 pounds of luggage. 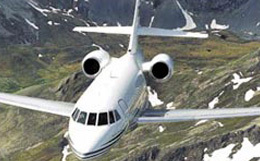 The Falcon 2000EX is capable of maintaining a sea level cabin pressure at an altitude of 25,300 feet. The landing gear of the Falcon 2000EX utilizes dual wheels on each unit and is hydraulically actuated and electrically controlled. Incorporated into the landing gear’s braking system are two hydraulic systems, with one system providing an anti-skid system. The Dassault Falcon 2000EX comes equipped with two Pratt and Whitney PW308C axial-centrifugal flow turbofan engines. Each engine is rated at 7,000 pounds of thrust and features dual FADEC controls. The engine parameters of the Falcon 2000EX are set up to be displayed on three LCD screens. With these engines, the Falcon 2000EX is capable of reaching an altitude of 37,000 feet in just 16 minutes. This private business jet needs only 5,585 feet of runway to take off at sea level and requires only 2,640 feet of runway to land. 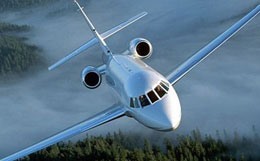 In a long range cruise configuration, the Falcon 2000EX is capable of flying 437 knots at an altitude of 43,000 feet. For a swifter flight, this private jet can fly 482 knots at an altitude of 39,000 feet in a high speed cruise configuration. The Falcon 2000EX comes standard with a Rockwell Collins Pro Line 4 system. This system utilizes four large format CRT displays in conjunction with an APS 4000 auto pilot system, dual Collins ADC 850 digital air data computers, Honeywell Laseref IV IRS’s, an Allied Signal EGPWS, dual Collins FMS 6100 flight management systems, an Allied Signal CVR, a Collins HF 9000 high frequency radio, Doppler turbulence detection weather radar, an emergency location transmitter (ELT), a Collins ALT55B radar altimeter, Sextant 3-tube EIEDs, and the Collins Proline 4 ARINC 429 radio comm/nav system. The Flight Dynamics HGS 2850 head-up display is offered as an optional addition. 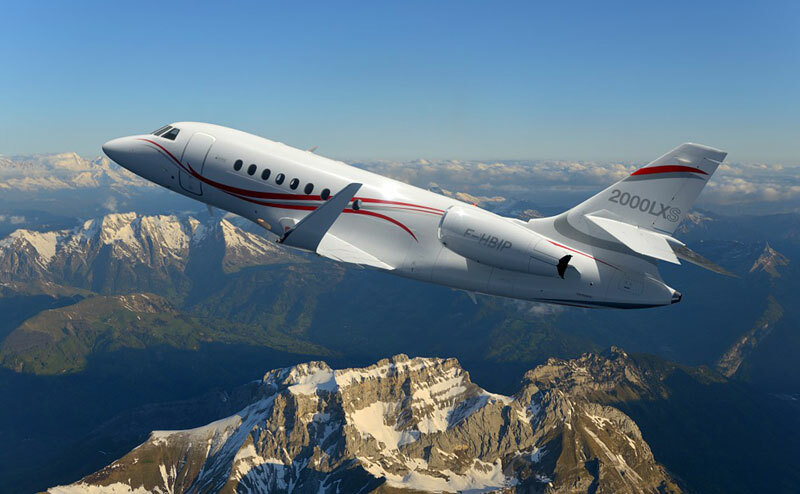 For more information about chartering, leasing or buying a Falcon 2000EX please contact us by calling +44-20-3874-8091 or send us an email here.